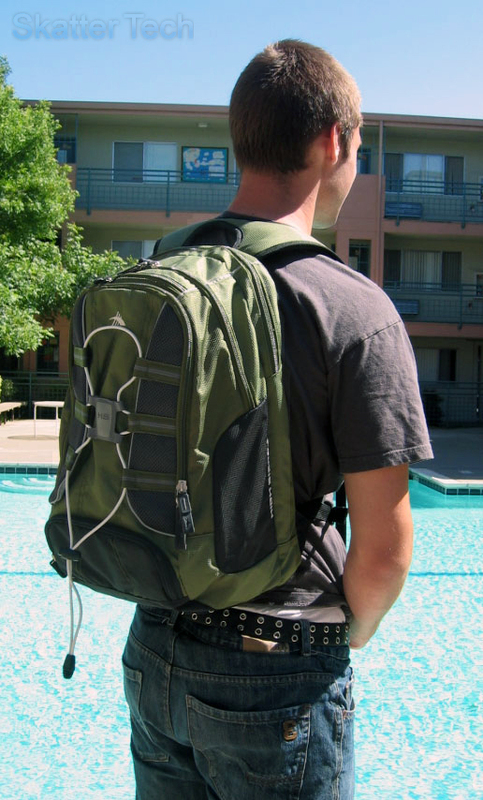 High Sierra’s grid is a light-weight sporty backpack that does not disappoint. It has a range of bright, yet not gaudy, color mixes and is very nicely styled for the active day-adventurer. Loaded with functional pockets, the High Sierra Grid makes separating your goods easy and convenient. This pack excels when you need something mobile and comfortable on the fly. The High Sierra Grid is constructed of 600D “Duralite” material. This is a type of polyester that is incredibly light. While the Duralite construction isn’t as strong as some of the other ballistic nylon and cordura materials used in the other packs, the significant weight savings of Duralite are certainly appreciated. The Grid uses a “waffle-weave” construction which while not necessarily adding more strength, is more aesthetically pleasing and stands out as something different from the other packs. The back of the Grid uses very soft padding covered in vapel mesh. This padding has plenty of play and and is quite comfortable. The same padding can be found generously on the S curve shoulder straps. One interesting thing about the rear padding configuration is the large gaps it leaves around the sides of your back while wearing the pack. This allows for generous amounts of airflow and ventilation. On the inside, the Grid disappoints. A much thinner and weaker material is used. Looking at the stitching in some areas just screams, “cheap!” Looking at the laptop compartment elastic top keeper we see how it’s only held on by a weak cross stitch which isn’t very re-assuring. Where the stitching is most disappointing is the front pocket. The accordian like wings that fold out to hold your items are very poorly stitched and appear as if they’ll rip from the slightest persuasion. Nowhere on this pack are there any signs of double-stitching. While it seems the outside of the pack is sturdy enough with the standard stitching, the extra added peace of mind from double stitching would be nice to see. One thing that is appreciated is the internal frame sheet located in the back adding rigidity and protection for your laptop. 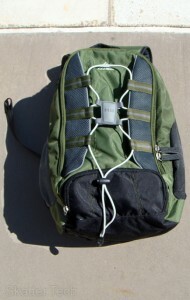 The High Sierra Grid also follows a conventional pouch layout. Located closest to the user is the laptop compartment. This pocket might seem like the main pocket, but is really just meant to hold your laptop and a small spiral notebook or two. 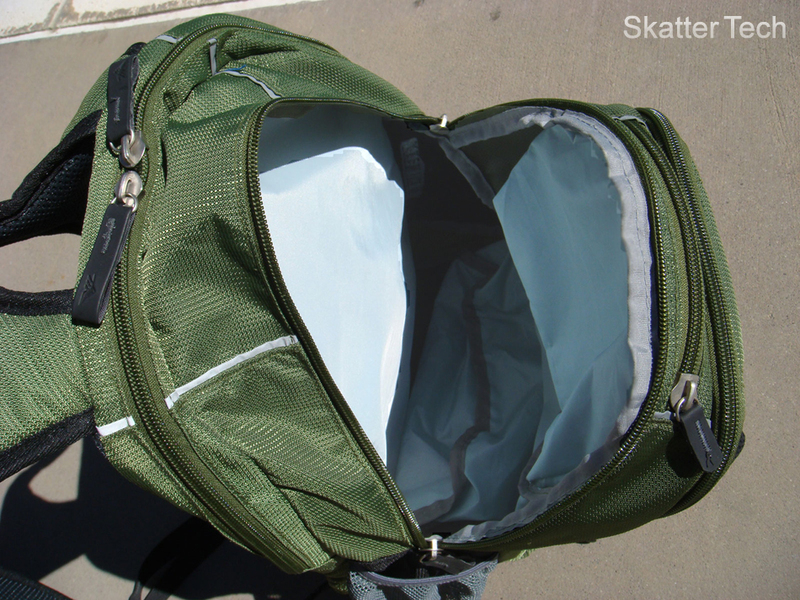 Keeping along with the “any laptop compartment can double as a hydration bladder compartment” ideal, this separation of the main pocket and laptop compartment is a great idea as should some water escape from the bladder, it won’t soak your contents in the main pocket. Moving out, we see the main compartment. While not huge, this main compartment is sized normally to carry an everyday load. It’s interesting to see the lower front pocket expand into the bottom of the main compartment though as that could either limit how much you put into the main compartment, or would severely limit the space of the lower front pouch. A small accessory pocket is located up top next. This is a very convenient pouch and is greatly appreciated. The following pouch is the front organizer. High Sierra left a good amount of room here for your writing utensils and gadgets. Unfortunately the key hanger seems very cheaply made and doesn’t seem as if it will last long. The most interesting pouch is the front lower pouch. 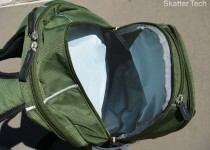 It has a good amount of room once expanded and seems like the ideal place to stash your lunch or piece of clothing. Unfortunately it intrudes on the main compartment’s inner space and is thus severely hindered. 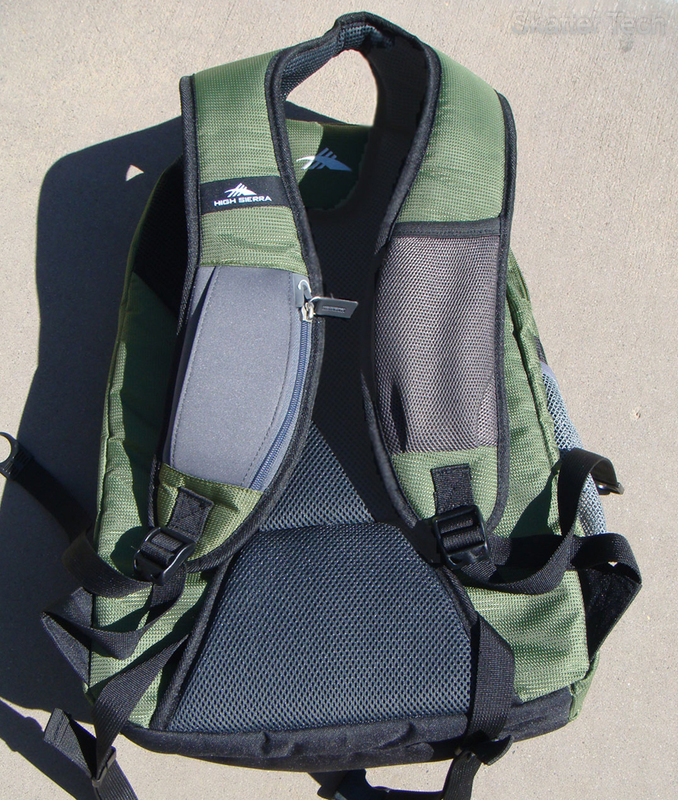 One main difference between the High Sierra Grid and the other packs was the inclusion of the carry handle on the shoulder straps. This method has a sleeker look, but led to a few bugs later. 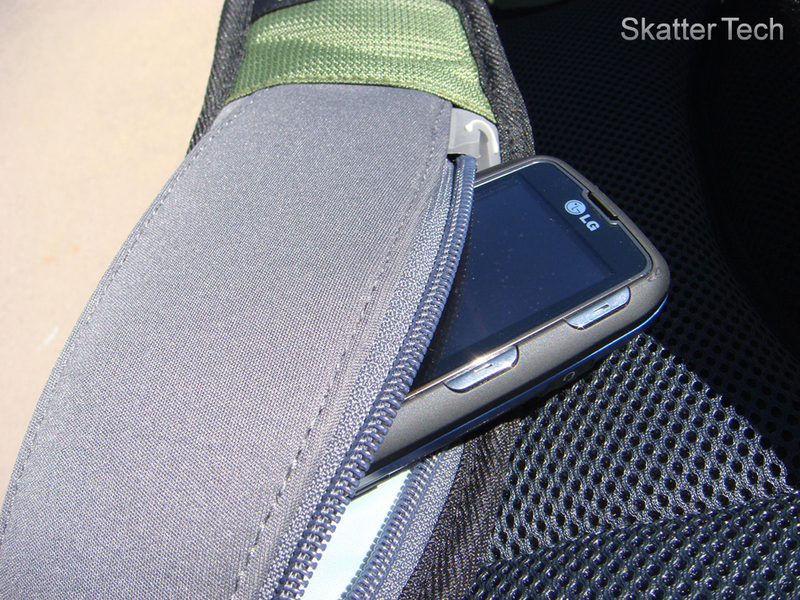 Located on the shoulder straps are a mesh elastic pouch for your keys or cell phone and a zippered mp3 player pouch. The mp3 pouch isn’t very large and the thought of cramming an ipod touch in there is a long shot. 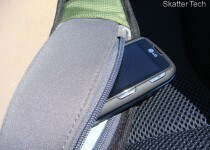 It does however work well for flatter cell phones and I ended up swapping spots (cell phone in mp3 pouch, mp3 player in cell phone pouch) frequently. Overall I’d say the Grid contains a very functional and convenient design for everyday use. The generous amounts of padding make the High Sierra Grid a pleasure to don. 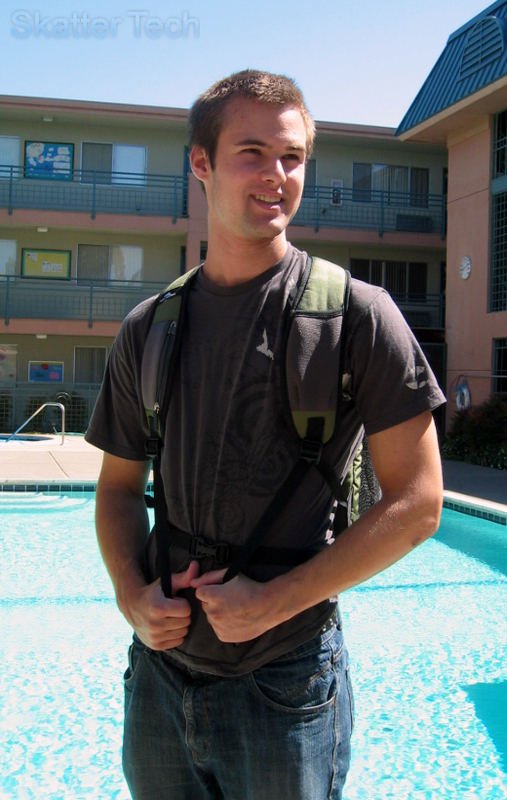 The S-shoulder straps provided a very comfortable experience and distributed the weight well. I found it interesting how the majority of the padding on the back was located right down the center of the pack, where your spine is. While this may sound like a bad idea loading up all of the weight on your spine, High Sierra’s implementation of it proved comfortable. With heavier loads the Grid performed well. You knew the weight was there, but it never irritated any one pressure point. Going back a little I mentioned the awkward carrying handle. While walking the handle wasn’t a terrible annoyance. While riding a bicycle however, the handle became very intrusive. 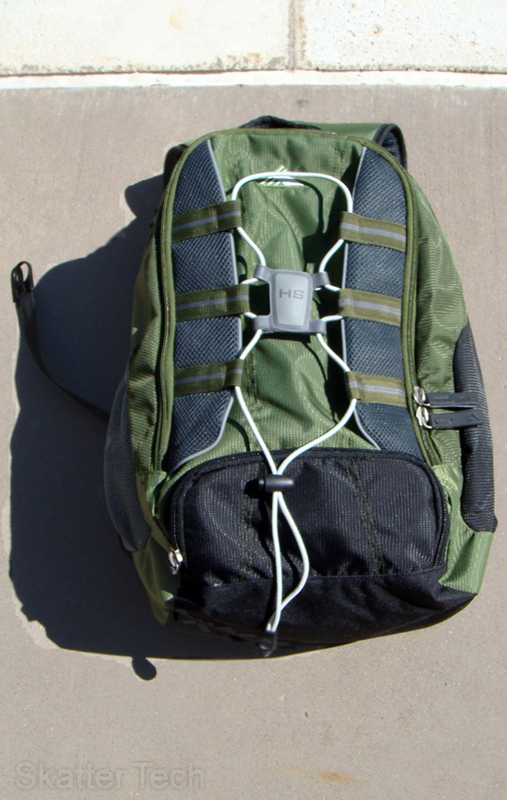 If you like to wear your backpacks loosely and let them hang down the carry handle shouldn’t be a problem, but if you’re looking for a proper fit and weight distribution like the pack was designed for the carry handle will be an obstacle. Aside from this single bug, the High Sierra Grid gets high marks for comfort.